Filipinos have a romantic streak and even as early as January, many are already thinking of the next month’s signature holiday – Valentine’s Day. Couples young and old look forward to Valentine’s Day 2016. Why not try something different this year? Here are some fun Valentines date ideas to make this occasion much more memorable than ever. This hot air balloon fiesta is an international gathering of hot-air balloon aviators from all over the world and takes place in Clark, Pampanga from Feb. 11-14, 2016. The event is not only aimed at developing discipline and safety principles among hot-air balloon pilots but also a chance for them to mingle with other cultures during the fiesta. And those colorful balloons all flying in the air at the same time do make for a truly awesome photo shoot moment with your loved ones. Even though the event runs through Valentines Day, it is not just for couples but also for the whole family or barkada! Entrance tickets cost only PhP350 per head for a good view of the participating balloons. Gates open at 5AM so be there early as seating is on first-come-first-served basis. If you have money to burn, why not try a real hot-air balloon ride with your loved one for $350? Most balloons have only a 4-person seating capacity (2 pilots plus 2 passengers), so it’s perfect for couples. That will surely sweep you and your loved one off your feet literally! You can reserve and pay for your ride online. Before you go on board, you and your partner will be given a briefing on safety measures. Two pilots will be with you during the 20-45 minute ride. Availability of balloon rides is subject to prevailing weather conditions. Any cancelled balloon rides will be refunded. Buy your tickets here. If you love pop music, there are two upcoming concerts around Valentines Day this year. 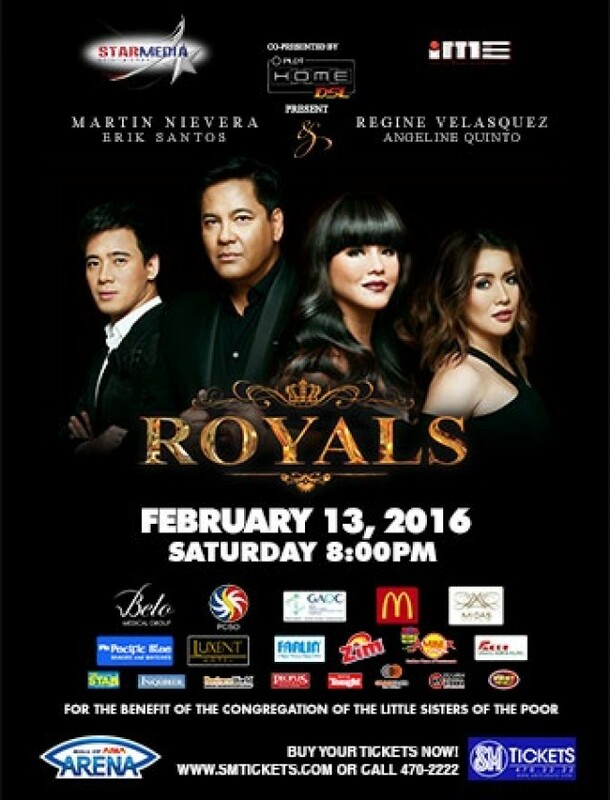 Veteran performing artists including Martin Nievera, Erik Santos, Regine Velasquez, and Angeline Quinto will be at the Mall of Asia Arena on Feb.13 at 8:00 in the evening to render OPM songs for you and your special date. 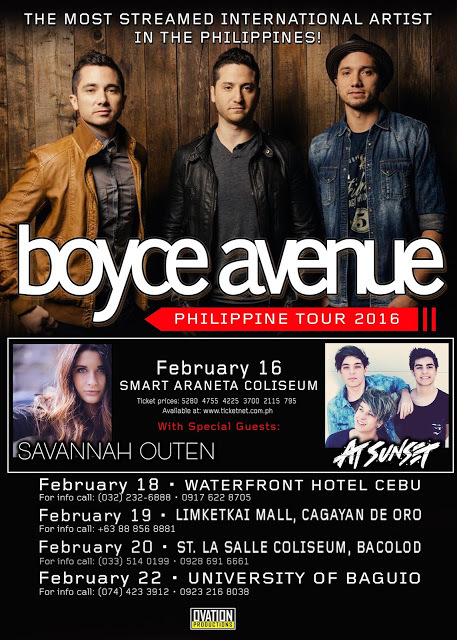 Internationally-acclaimed Boyce Avenue with special guest Savannah Outen will sing to your heart’s content this Feb.16 at the Smart Araneta Coliseum. Watch them perform their heart-throbbing hits “Every Breath”. “On My Way” and “Broken Angel”, as well as acoustic covers of romantic songs of other artists. With your Valentine date, of course! And fortunately, these two concerts don’t exactly fall on Feb. 14, so you can still have that special dinner and intimate moment with your significant other, and have the best of both worlds! Flowers are an integral part of Valentine’s Day. What better way to see flowers than in Baguio City, where their beauty is highlighted at the annual Panagbenga Festival held every February. This festival features floats of all sizes and shapes, decorated lavishly with flowers pretty much like those you see in the Pasadena New Year’s Day Rose Parade. 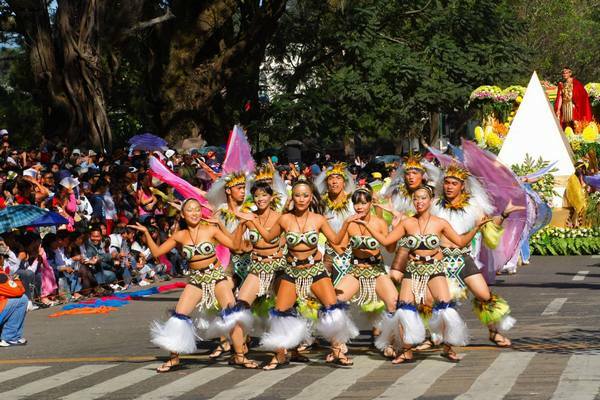 There is also a lot of street-dancing which is performed by dancers dressed in flowery costumes inspired by an Ibaloi celebration dance. You practically have an entire month to see those lovely floral exhibitions. Baguio is also a great place to take your R & R, away from the heat and pollution of Manila. This year, make a point to drop by with your loved one and smell the flowers! Here’s one of the most unique Valentines date ideas. If you and your loved are adventurous types, why not go up to Mt. Kiltepan in Sagada? This is only about a 40-minute hike from town. The best time to start is at 4:30 AM. Get there before sunrise so you can find a good vantage point to witness the glorious rays of the sun on the horizon over picturesque and almost-unreal views of rice terraces below it. It’s truly heaven on earth! This trip is best before or after going to Baguio’s Panagbenga Festival. Who says staycationing can’t be fun? As with Christmas and New Year, many luxury hotels offer oodles of valentines promos for Manileno lovebirds. The special offer of Makati Shangrila‘s Circles at 1,280 nett has been extended! You can enjoy the best lunch and dinner buffet in the heart of Makati at its best price until February 29 only. Dusit Thani Hotel has special room packages complete with buffet breakfast, complimentary champagne and chocolates. Sofitel sets the Valentine mood with a spectacular sunset dinner by the open sea, a private serenade, and firework displays. Vivere Hotel in Alabang offers serenades and dinner under the stars. For something more unique, try a palm-reading session at Midas Hotel and get free candy giveaways at the bar area, or stay the night and enjoy a free breakfast buffet as well as watch Rex Smith perform love songs for you. Want something less draining on your pocket? Try Bayleaf Intramuros’s own Valentine package. For only Php1,200 per person, enjoy two buffets, two dinners, and two shows. Check out other fantastic hotel dinner / room packages for Valentine’s Day. Sunsets on the bay are breathtaking moments that a couple in Manila should not miss. You can arrange with Sun Cruises to take a dinner cruise along the bay. Enjoy a sumptuous Filipino dinner menu which changes nightly, plus a serenade by a local band. After the sunset, watch the sparkling lights along Roxas Blvd. and Mall of Asia. On a tight budget? Then just enjoy strolling along the newly renovated baywalk and still be able to capture that Manila sunset. You can also savor local delicacies from baywalk vendors or walk to two iconic restaurants, like Aristocrat and Emerald Garden for dinner. Next PostNext Manila Pub Crawl is Back!